Zambia is the untamed African bush, with unspoiled wilderness and wildlife. Vast lakes, verdant wetlands, and three long rivers teeming with game and birds. A tradition of guiding and walking safaris contribute to Zambia’s appeal as a premier safari destination. Walk through the bush, float down a river past a pod of hippos, or get drenched in the mist of the mighty Zambezi River as it tumbles over Victoria Falls. The country is home to 72 ethnic groups, each with its own cultural traits and traditions—all of whom are warm and welcoming. The astonishing beauty of the Zambezi River as it plunges more than 328 ft into the steeply-walled Batoka Gorge has been drawing visitors long before David Livingstone named it for the Queen of England. 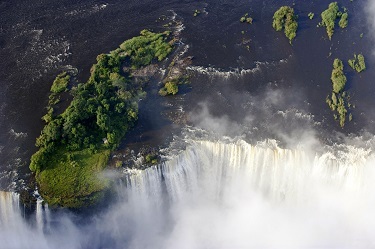 Its African name is Mosi-oa-Tunya (The Smoke That Thunders) and it’s the world’s largest curtain of falling water, twice the height of Niagara Falls and several times longer. Experience the sheer power on both sides of the mighty Zambezi—in Zambia, and Zimbabwe. Livingstone is the jumping off point for activities on the Zambian side of the Falls, while the town of Victoria Falls is the charming hub on the Zimbabwe side. Each side has wonderful national parks with different views of the Falls, and its own attractions. During the low-water season, adventurers can jump into Devil’s Pool from Livingstone Island (Zam side) and swim right up to the lip of the falls! Three great rivers—the Luangwa, the Zambezi, and the Kafue—flow through Zambia and its national parks and game reserves. The broad floodplains and lush riverbanks make for exceptional wildlife viewing. 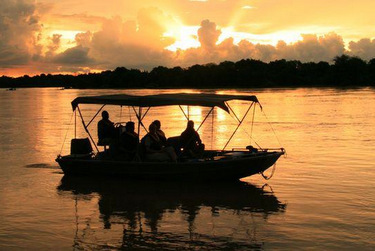 A boat trip down any of the rivers is a must while in Zambia. View pods of hippo, frolicking elephants, and some of the largest crocodiles in southern Africa. Zambia’s premier wildlife sanctuary, is home to one of Africa’s largest concentrations of wildlife. Birthplace of the walking safari—experience the sights and sounds of the Africa bush at ground level on a trek in South Luangwa’s pristine wilderness. Grassy open plains and the lush banks of the Luangwa River teem with hippo, crocodile, elephant, Thornicroft’s giraffe, Cookson’s wildebeest, African wild dog, buffalo, lion, baboon, and antelope. The density of leopards is among the highest in the world. 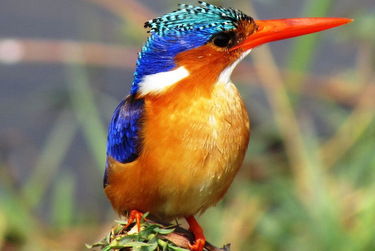 Over 400 species of birds make the Luangwa Valley a birder’s paradise. It is one of the few national parks in Zambia that allows night safaris. Lower Zambezi National Park is still relatively undeveloped. While the diversity of animals is not as wide as the other big parks, the opportunities to get close to game are spectacular. Float down the Zambezi and hippos are always in sight. Elephant, zebra, puku, impala, buffalo, kudu and baboons browse on the banks. Lion and leopard sightings are common. Birdlife along the riverbanks is exceptional. The park lies opposite the famous Mana Pools Reserve in Zimbabwe, so the area on both sides of the Zambezi River are a massive wildlife sanctuary. The largest park in Zambia is also one of the biggest in the world. Kafue is rich in animal life with terrain ranging from the lush riverine forests of the Kafue River to the vast grasslands of the Busanga Plains and it is one of the best places in Africa to find leopard and cheetah. The array of habitats in Kafue offer the chance to view over 500 bird species living in or migrating through the park. 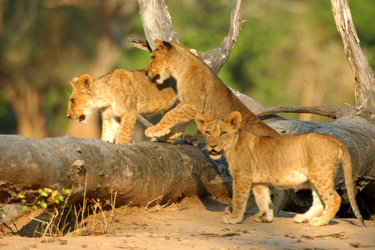 The name Norman Carr is synonymous with wildlife conservation and safaris in Zambia. Though Carr pioneered the photographic walking safari in Zambia, there are now many other great lodges that offer their own unique walking safari experience. Today, Zambia is one of the few places in Africa you can walk with the animals and many of the bush camps are set up so that you can walk between them. Stay as honored guests in a traditional village of the Kunda tribe, located in South Luangwa National Park. This is a rare opportunity to join in village life, while benefiting the community in support of education. You’ll be welcomed by the village chief and villagers who are delighted to show guests their way of life—stay in a simple thatched hut for a day or a week, take village and bush walks, visit or teach in the local school, join in dancing and storytelling in the evenings and make a difference with this award-winning community project. Victoria Falls is located within 62 miles of the four corners of Zimbabwe, Zambia, Botswana and Namibia. It provides access to all four countries. An exciting add-on to any trip to Victoria Falls would include a trip to Chobe National Park, Botswana, known for its prolific wildlife, especially its spectacular elephant herds. Spend a day or more on a game drive in the Savuti Marsh or by boat along the Chobe River. Zambia has three distinct seasons. Because many national parks have limited road systems, travel is driven by the seasons. Dry season—May to August. The best time of year to visit Zambia. The early dry season shines for bird watching or to see Victoria Falls at its best. Later in the season, when the bush has dried up, is prime time for game viewing on safari. Hot season—September to November. Temperatures soar but if you can take the heat, it's a good time game viewing as wildlife clusters around the few remaining watering holes. Wet season—December to April. While large sections of the road system become impassable and many safari lodges close, the "green" season has its attractions. Lush riverbanks teem with game and migratory birds.